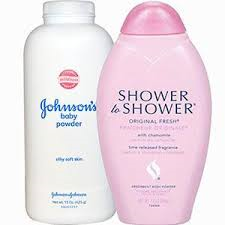 Johnson & Johnson products such as Johnson’s Baby Powder and Shower to Shower have recently come under fire. According to the International Journal of Gynecological Cancer, frequent talcum powder use on the female genital area increases the risk of ovarian cancer between 30–60%. The more often a woman uses it, the more likely she will experience ovarian cancer. In the early 1970s, scientists discovered talc particles in ovarian tumors. In 1982, Harvard researcher Daniel Cramer reported a link between talcum powder and ovarian cancer. His study was followed by several more finding an increased risk of ovarian cancer among regular users of talcum powder. Cramer, who at one point advised Johnson & Johnson to put a warning on its products, has become a frequent expert witness for women suing the company. Johnson’s Baby Powder and Shower to Shower do not carry a warning label mentioning the risk of ovarian cancer with frequent use. Because talcum powder is legally considered a cosmetic, it does not have to undergo a review by the US Food and Drug Administration like a drug would. However similar talc-based powders on the market carry labels that mention the possible risk of ovarian cancer after frequent application to the female genital area. Laird, Baker and Blackstock is currently evaluating cases involving ovarian cancer caused by talcum powder. If you have been diagnosed with ovarian cancer and have used talcum powder frequently and over a long period of time, call our office or click the link below to schedule a free consultation. There is not a fee unless we recover.